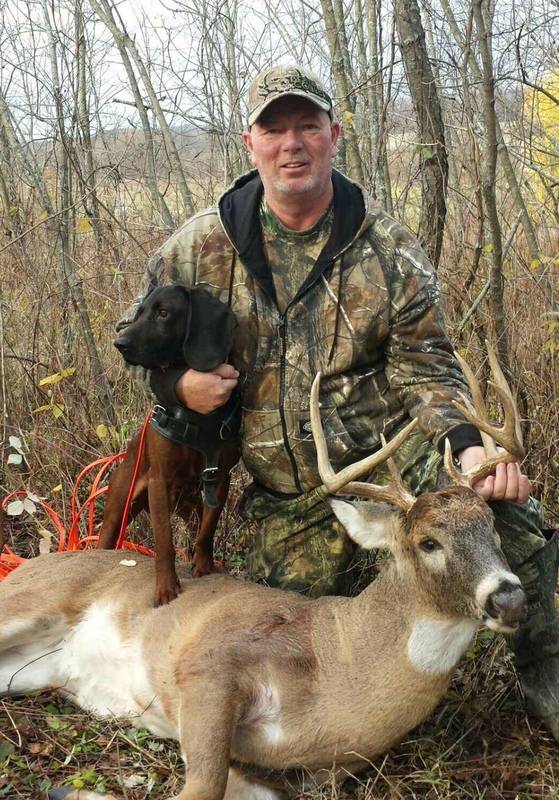 We offer tracking for wounded deer with our Bavarian Mountain Hounds on an as-available basis. Linda and I are both very active with The United Blood Trackers Organization. We spend a considerable amount of time training and laying tracks in the summer months. Our dogs were imported from Poland and Slovakia with special attention to making sure they came from working lines. Our Polish hound Kieler, was named 2016 Tracking Dog of the Year for the U.S. and Canada by the Bavarian Mountain Hound Club of America in recognition of his recoveries. We will do our best to find your deer, but please understand, we will not recover every deer. The following are some tips to help with a successful recovery. If you think for ANY reason the hit is questionable, do not attempt to recover the deer. Simply walk out quietly and call us. If you start tracking and lose blood, do NOT start walking around trying to locate it. You are carrying micro specks of blood to other areas, thus making it much tougher for the dog. Back out and call us. Get permission from neighbors to track on their property, just in case. We will not trespass!!!! When we arrive to help you, please be prepared to listen to a brief explanation on how the tracking will proceed. Also, in Wisconsin it is illegal for the hunter or tracker to carry a weapon while using a dog to track. Please be prepared to leave your weapons behind. The sooner you call us the better. We would much rather come out for a track that you may not have needed us for, than to try to follow a track that has been compromised. Even an easy track is great work for our dogs. Pay very close attention to where the deer ran after the hit and try to mark the EXACT hit site. Please note that our policy has changed beginning in 2016, and there will be a charge of $100 per call. Gratuities are appreciated, but not expected. We regret having to make this decision, but this is due to a few bad apples ruining it for everyone. Please call Sean @ 608-516-0275 or Linda @ 608-225-9808. Do NOT call the kennel number please. If we don’t answer, please leave a voicemail. We will usually get back to you within the hour. 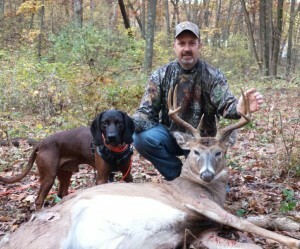 Thanks to Sean and Kieler, my buck was recovered and I had one of my most memorable hunts ever. While sitting on the ground, I was able to get a shot at a nice little buck with my bow. I knew the shot was lethal, but I could see that it was a little far back. I was worried about tracking in the evening and pushing the deer, especially with heavy rain in the forecast overnight. After giving the deer an hour after the shot, I began the tedious task of tracking. Making sure to step no further than the last blood I found, I had made 40 or so yards of progress in an hour before it got too dark and I lost blood. Worried about pushing a potentially live deer and messing up the scent trail, I backed out and called Sean. It rained hard overnight, but Sean agreed to come out with Kieler and attempt the track. When they arrived I broke the news that we would be paddling a mile or so upstream on the Wisconsin River. Once at the sight of the hit, we could see that rain had washed away the once visible spots of blood. I did my best to guide Sean and Kieler in the direction of the deer’s travel, with the hope that Kieler would still pick up some scent. After making it past my mark of last blood it was clear that the trail was hard work for Kieler, but he pressed on. As he worked I could see that with each sniff he took he was processing thescents in his mind. He worked methodically and at an easy pace, transitioning more to scenting the air instead of the ground as he carefully moved through the woods. Periodically he would stop and Sean would ask “Are you sure?” as Kieler looked back. If he had lost what scent he was following, Kieler would turn back and go to the last spot he had it and continue the track. With the wind swirling in the woods it became apparent during the track that Kieler was getting wafts of body scent and losing it, causing him to stop and backtrack or change course. We went back to last blood again and let Kieler take over. This time he seemed more confident in the direction he wanted to go. One last “Are you sure?” from Sean and Kieler took off down a new trail at a clip almost too fast for us to keep up as we moved through the prickly ash. About 80 yards later he really started to move. Just after Sean made the remark that he was on to this deer’s scent for sure, we saw the white of the buck’s belly. I was relieved to have recovered the deer, and my adrenaline was rushing from watching Kieler work the track. It was an exciting hunt and track, which I will never forget. It was also a bit of an adventure for Sean and Kieler canoeing back down the river with a deer in the boat. I am very thankful that Sean took the time to come out with Kieler. They make a great team. I thought I was a good and well seasoned tracker until I met Sean Timmens and his dog Kieler. With the uncertainty of a fatal hit and blood for about 100 yards with the arrow still in the deer, I made a call to Sean, to see if he would be interested in giving his dog a shot at finding the deer. Upon arrival, I showed Sean and Kieler precisely the location where I shot the deer. Kieler buried his nose in the track and went to work. As mentioned earlier, while I had a blood trail for a distance, Kieler was not interested in that as much as the scent of the track. We arrived to where I backed out, and let Kieler take over. What I witnessed over the next 20 minutes was nothing short of WOW. Kieler moved ahead of us and came to a stop about 20 yards away. He was showing his acute, keen senses and was on high alert to something. Sean walked ahead to see what Kieler was telling us. Sean turned around and said “He found your arrow.” We kept walking and I was able to point in the general vicinity of where I last heard the deer running. Kieler eventually intersected the deers path on the lower end of a very steep ravine. Instantly he went into high alert again and started moving fairly steady, leading Sean along. Within a couple of minutes, Kieler was over a knoll, in a thicket and out of sight. Next thing I hear is Sean saying “Do you want to see your deer?” I headed their direction and Kieler was standing next to it looking to be rewarded, knowing he did his job. Ironically, there was no blood from where the arrow was removed to where Kieler found the deer, approximately another 150 yards, yet Kieler led us right to it. What was so amazing was Kieler’s tracking performance was executed nearly 24 hours after I shot the deer and after numerous other deer crossed through the area. Sean stated that one of the keys to Kieler’s success was by me backing out and waiting until they could arrive. 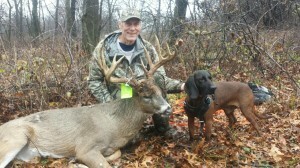 This gives his dog the best chance to get on the deer scent before the area is contaminated with human scent. The only thing I regret was not videotaping the entire event. It was nothing short of impressive watching Kieler do what he is trained to do in following a scent trail. One can easily tell the passion, pride and professionalism Sean has with working his dog. I would highly recommend calling them for assistance if ever needed. Sean is a very genuine guy with a great personality and Kieler is more than pretty darn cool. What a team to have in your back pocket if ever needed. I really appreciate Kieler and you for coming all the way down south of Broadhead Wisconsin. Kieler is AWESOME and I am so glad you helped me tag my FIRST BUCK with a Bow. After I hit a nice buck last year and couldn’t find it I was just sick not only for myself but for the deer as well to end that way. It’s about finding that animal, and I appreciate that you were gracious enough to give me the opportunity to harvest it. You owe it to the animal to find it. You can bet I will be telling all my friends and everyone I talk with about you two. 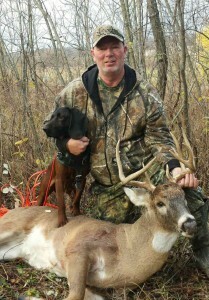 Thanks Again and thank you for being my two new best deer hunting buddies !!! I am writing this recommendation in support of Sean Timmens and his dog Kieler. 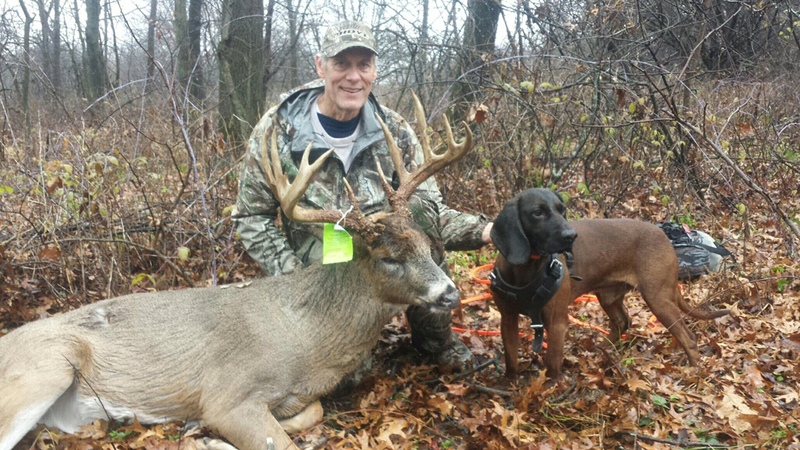 I had the opportunity to watch these two in action recently when they helped me search for a wounded deer during the Wisconsin bow season. First, I was impressed with Sean’s professionalism and genuine interest to help. 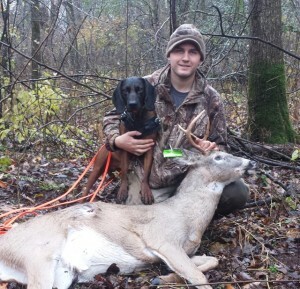 Sean is highly knowledgeable both about hunting and tracking. 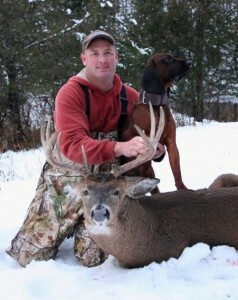 Clearly, he is an expert with dogs performing in a range of different types of hunting, tracking and training. Second, I was impressed with the performance of the two working in tandem like a well oiled machine. Sean and the dog quickly snapped into action and they efficiently moved through the land methodically and with purpose. It was not long before they were on the track of the long-lost, wounded deer. The subtle communication back-and-forth between Sean and his dog was amazing to watch and experience. They were both all business once in the field tracking the deer. It was an almost impossible task with the wound being one where the deer left very little blood or sign and the terrain was diverse. Soon they were on the cold track and were able to find where the deer had both bedded down and later moved to find deeper cover. They amazingly and successfully were able to track this cold trail through thick cover, open field, heavy dew, a swiftly running stream and ultimately into dense corn. I have experienced other trained tracking dogs on a hunting trip to Africa where they use specialized dogs out of Europe to track game. There simply is no comparison—Sean and Kieler are top tier. Sean is definitely the “horse whisperer” of hunting and tracking dogs.